It’s a great pleasure to welcome Shannon McLaughlin, who is the owner and founder of baby carrier maker Ubuntu Baba. Shannon, thank you so much for joining me on the podcast. Now, you were in the headlines last week, after you wrote a blog post describing how Woolworths had copied your Ubuntu Baba carrier. Woolworths didn’t just copy it though, they went on to sell their carrier at a much lower price. But amid an outcry, they then pulled their product off the shelves and they’ve interacted with you. So, what’s the latest development on this now? We are at a point now where we are talking about a settlement and the terms of that settlement. I did say that I really wanted Woolworths to step up and show us how they are going to make sure that this isn’t going to happen again, and that is something that is very important to me because it’s not just the last few days that have been stressful. It’s like the last 3 or 4 weeks since I’ve found this out. So, it’s had a massive toll on my personal life, as well as the business side of things. So, we’re at that point at the moment – there’s obviously, a lot of stuff that obviously needs to stay confidential but I think what I said to Woolworths is that I will be doing a follow-up post and that the public needs to know what has happened to resolve the issue. There’s lots of things in play at the moment. For example, the remaining stock that we were talking about. There were talks about what to do with that and there’s an issue there because we can’t just donate it to a charity. There’s obviously, the safety issues with the carrier so, I’m going to be assisting them to just test the different waist ranges that a baby can actually sit in there because it’s not safe for newborns. So, they’re going to have to up the waist range and repackage everything before it even gets donated. So, there’s quite a few things that are still in discussion but I’m in a much better space with them, conversation-wise, because I’m now dealing with the CEO, which makes me just a little bit happier that they’re taking it more seriously and hopefully they are going to take the necessary measures to improve their internal procedures. They’ve said that they would donate a lot of those carriers that they made to the public. But as you highlighted in your blog post there’s certain safety concerns there. So, can you maybe explain those? They’ve copied your carrier but they seem to have neglected the most crucial aspect of it. Yes, baby-wearing is a whole different ball game in terms of baby products because you’re wearing the baby on your body. So, it’s not just like a carrycot or something like that. What comes into play is the baby’s weight range, the baby’s neck control, head support and things like that. So, what I can gauge is that with our carriers, we’re aren’t able to pump out of the factory massive quantities because of the nature of how the product is made. It’s quite an intricate design and there’s a string that grows across the centre of the baby carrier, which is almost like pulling a tog-bag shut with a drawstring and it narrows the seat that the baby’s bum sits in. So, what happens is that with a little newborn baby it’s just able to cover the nappy area of the baby so that it can still sit in the ergonomic position that when you hold a baby to your chest, it assumes the position that it was in when it was still in the womb. It’s a very curled up position and you don’t want to overstretch the legs at all. That is the issue with the body that they’ve chosen there. So, I assume – and this hasn’t been explained to me – but I assume that in China they want to make a carrier that’s easy for manufacturing, and my pattern isn’t exactly easy. Woolworths admitted that they did use my carrier for inspiration, among others so, I’m not sure which other one they used for that inspiration but it wasn’t my body – it’s the centre panel, and that’s what caused the issue there. I think if you don’t understand baby-wearing, you aren’t aware of these safety concerns. So, if a mum places the baby’s legs inside the carrier there’s a few risks, one of them being that there’s nothing holding that baby in place – it can slip down below the waist band. The other aspect is there’s actually no head support at all, for a newborn, in that carrier, which is obviously an important factor. This whole debacle has really exploded into the national news headlines and onto television and radio, print, everywhere. So, how has Woolworths dealt with you regarding this matter? How would you say that they’ve handled this? It’s not completely handled to the end yet but up until this point I still am quite amazed by the lack of intervention from a higher point. They just seemed to be silent for so long. I think there’s many areas that needed work. My complaint was emailed to three email addresses earlier on in December and nobody took it seriously because it was just given a reference number. They did inform me that they were sending it to the legal team but whoever received the email in the legal team obviously didn’t take it seriously. If I got a letter to my business and I got an email like the email that I sent, with a deadline and threatening to take it further – I would have taken it much more seriously and at least given one phone call, if anything and if maybe the timing was wrong they could have said, ‘well, do you mind giving us a little bit of extra time,’ or something. I’m a reasonable person but there was nothing. I’ve got a small business and even I’ve got crisis management. That, I think, is something they really need to work on especially with their history with Frankie’s and what they’ve been through before on social media. It just blows my mind, really. So, when you say that it took awhile for the guys high-up at Woolworths to respond to you, who are you dealing with there now? You said the CEO, but is that the Group CEO or is it the national CEO? Well, I’m dealing with Zyda Rylands so, I put out that I wanted to speak to Ian Moir because everybody was telling me, ‘where’s Ian Moir,’ all over social media and I don’t know who the CEOs of Woolworths are but everybody was saying, ‘why is he silent for so long?’ So, I just said well, he must be a CEO and I said, ‘that’s it now.’ After the last letter that I received from them, which I felt it was just them taking it so lightly and by the pointers I got from social media and the radio – my phone was just ringing off the hook. It was impossible to live my life at all and I thought how can they just be ignoring this now? This is getting ridiculous. So, then I called for Ian Moir and I set a deadline. I thought well, maybe they’ll respond now because if whatever I’m saying at the moment, the newspapers and the radios are just replicating it all over the show. So, I kind of just used the power that I had in that moment and thankfully Zyda phoned me the next day. We had a great conversation and it was actually, really nice to talk with another woman on the topic because it was easy for us to relate to each other and we had a really good conversation. We let each other say what we needed to say. I do think that we’re in a much better space now for finding a way forward that is positive, and hopefully positive for them as well because they do have an opportunity to show SA that it’s quite obvious that this behaviour has been going on for a long time and this is what we’re going to do about it. But they really need to own it because people aren’t happy – I don’t think I have to tell you that. I was reading your blog and I thought it was very interesting that you said that you guys picked up that somebody from Woolworths had, in fact, ordered your carriers, right? So, that happened a few months back and then suddenly you see it on the shelves of Woolworths. Do you know who that was? Who was the person within Woolworths who made that call to essentially create their own carrier but with such strikingly familiar features to yours? Well, when I put the blog post out, I had sent them [Woolworths] those people’s names already. So, they were quite aware of all this information. So, everything they saw on the blog post they had already known about and we searched Woolworths on our database and those two sales came up with enough timing for them to replicate. The timing made sense so we put that out there. We blacked out the people’s names and when we looked up those names on LinkedIn and Facebook, both social media channels showed that the positions were sourcing, administrator and product developer. Now, obviously, that could be old information. Obviously, those people could have been mums that purchased those carriers and that is what we were quite aware of, and it’s what I wrote in the blog post that this could be a total coincidence. But that means that there’s a coincidence with that, with the same naming, with it looking almost exactly the same, and the same colours – there’s just too many coincidences so, I asked them about that. Their internal investigations said that those were mums and we also received communication from those mums as well, which I haven’t put out into the public yet because I just haven’t had a chance, and I honestly do believe that they are mums that purchased the carriers and in the Woolworths’ media statement yesterday they said that they did purchase my carrier but I don’t think the public understood it well enough because they just didn’t do a good enough job with explaining it properly, is that they had mentioned in the comment section on Facebook, I saw further down, that their supplier purchased the baby carrier from us, as well as those two people that worked for them. So, they are basically saying, ‘it wasn’t those two mums but our supplier did purchase,’ and that’s how they had the carrier in their possession. A key question that would come to mind now is what you’ve done around trademarking or protecting your brand, especially in light of what has happened now. Have you had your brand trademarked? Are you in the process of doing it? I only have a trademark on Ubuntu Baba. I don’t have a new patent or anything on the design, which is obviously something I need to look into doing but, right now, I’m still wading through emails and it’s been very difficult because my son started school today, he’s 4-years old. The factory is opening on Thursday. There’s a lot of people that are interested in doing business with us, and customers that want to order. So, we’re dealing with a lot right now and I’m just hoping… I don’t think that anybody else would be silly enough to copy my carrier at this point in time. I’m hoping that doesn’t happen but obviously, I do need to go and do something. I have absolutely no idea about patents or about registering designs. Obviously, everybody is giving me information. I’ve got a lot of emails telling me how stupid I am as well, because I didn’t do it, which is totally understandable. The thing is that at the end of the day nobody teaches you how to do these things. It was exactly the same thing when I had to learn about tax and VAT and all that stuff. You learn as you go and you make mistakes along the way. That’s just part of being an entrepreneur. We’ll get there and I’ve got so many people offering me advice and help. So, we’ll definitely look at what’s the best way forward. As a last question. Has this whole episode turned out to be a positive thing for your business? Is there a silver-lining around the cloud here? Yes, for sure. We definitely had a spike in sales because we’ve just had so many people find out about it that weren’t even aware that we existed before and it’s the kind of product that mums like to do their research before they purchase something. So, there’s a lot of queries. But we definitely are having a better January than we usually do because it usually is slower because of the time-lag in delivering because we’re an online shop and the factory is closed. We only start shipping out again from next week, or from Friday, I think it is. So, it’s a kind of product that sometimes, if you can’t get it immediately, you just go to a shop and buy another brand or something like that. But it’s definitely had a positive spin. I don’t think that you can pay for the kind of PR that I got out of it. Shannon thank you so much for chatting to me about what’s happened and I wish you the best of luck with Ubuntu Baba going forward. Posted below is the original blog post that Shannon McLaughlin wrote on her complaint. The blog post is republished here with her permission. You can also read it on her website by clicking here. Dear Woolworths, you have some explaining to do. “Shannon have you seen this?” I open my WhatsApp to read the message and see a screenshot of the baby carrier I designed being sold on Woolworths’ online shop. I can’t describe the feeling that went through my body in that moment. It’s 16 December 2018 and I’ve just found out that Woolworths has shamelessly copied the complete design and concept of the baby carrier that I have put my heart and soul into for the last 4 years of my life. At first glance, it looks like they’ve just used my product name ‘Stage 1’ and ‘Stage 2’ baby carrier. On closer inspection, I realize that they’re using the exact same colours, grey and navy to my baby carrier. Upon further investigation, it appears that they have designated the terms ‘Stage 1 carrier’ and ‘Stage 2 carrier’ as Google Adword keywords. So when you search the term ‘Stage 1 carrier’ or ‘Stage 2 carrier’ – the exact names which are unique to my little business – Ubuntu Baba baby carriers and in which my business has a reputation in – Woolworths adverts come up above my organic search results. I’m so confused. Why would a big corporate go to such effort to try and copy my product and leverage off my marketing? This feels wrong on so many levels. They are selling the carriers for 1/3 of the price that I sell mine – because of course they just have it made in China, while we manufacture ours locally in our little factory in Retreat. This is my wonderful team, they come to work every day, Monday to Friday and make Ubuntu Baba baby carriers. We are proudly South African manufacturers, trying to make a difference by putting money back into the South African economy, instead of getting it made for a fraction of the price in China. Jane sees Angie wearing a comfy looking baby carrier. Woolworths gets a sale. Ubuntu Baba loses a sale. I can’t sleep, the anxiety of this situation is killing me. What do I do? I’m all for Woolworths selling affordable, ergonomic baby carriers, and I’m glad my little business has ‘inspired’ them, but there is a big difference in taking inspiration and blatantly expropriating another’s product – the way they have gone about this is nothing less than wrong. No. This can’t be. They have used my exact pattern. I don’t know what the next step is but I feel an instinctive urge to get my hands on one of these carriers, so off I go to Woolworths to go and check it out. Not only have they copied my ‘Stage 1’ and ‘Stage 2’ names, used my colours, designated Google Ad keywords to divert potential customers, Woolworths has also shamelessly copied my design and pattern. Their shoulder straps are exactly the same as ours, all they’ve changed is the body section of the carrier, probably to make it easier for production in China, as there are quite a lot of intricacies involved with ours. There is no other baby carrier in the world with a waistband pattern like my Stage 1 and Stage 2 carriers. My Father and I designed them from scratch in 2015. It took us weeks just to get that waistband right, and it’s arguably part of the reason why our baby carriers are so loved by many, because they are very gentle on a Mother’s healing c-section scar, yet still supportive enough for her to carry her baby from the very early newborn days. Moreover, the ‘Stage 1’ and ‘Stage 2’ are unique to the Ubuntu Baba brand, with no other baby carrier brands, using the same, or similar, naming convention. I feel like I’m out of my league. I call an emergency meeting with my team, I need help on what to do next about this. One of the ladies on my team suggests searching our online order receipts to see if anyone from Woolworths Head Office has ever purchased one of our carriers and surprise, we find that an Ubuntu Baba Stage 2 carrier was purchased and delivered to Woolworths Head Office in June 2017. Woolworths can surely not contend that they did not blatantly copy the design and concept of my carriers when the Ubuntu Baba Stage 2 carrier they purchased was delivered directly to a former Sourcing Administrator at the Woolworths Financial Services Building in Observatory. Surely there is nothing suspicious in someone from Woolworths Head Office purchasing one of my carriers? Alas, this is not the case. In September 2017, the Woolworths Product Developer purchased our Stage 1 carrier, which subsequently was delivered to Woolworths Head Office in Longmarket street. This is surely a very cruel joke? Right? By this point, friends and business acquaintances had told me about the hummingbird story and the Frankie’s case (which Frankie’s won), and that apparently Woolworths’ ‘do this all the time’. Really? And they get away with it? Yes, apparently they do. Because it’s not often, in the real world, that young entrepreneurs are ready to take on a retail giant like Woolworths. Of course, I have no evidence pointing to the fact that they ‘do this all the time’ as others have told me, but after all the effort gone to here, it’s honestly not too hard to believe. If you’re confused, so are others. As we are in the ‘babywearing industry’, it’s our job to be a part of many online Mommy and babywearing groups, where Mom’s go for advice on babywearing and reviews on different brands of baby carriers. The amount of confusion that has already been caused by the Woolworths carriers, as well as their use of our names ‘Stage 1’ and ‘Stage 2’, is really concerning. My heart literally breaks every time another Mom posts a photograph in the babywearing groups, telling other Moms how comfortable the new Woolies Stage 2 carrier is and how well impressed she is with their design. Dear Woolworths, that is my design. The only reason it’s comfy, is because you blatantly copied my pattern. I have reached out to you via email, on 3 different email addresses I could find, but all I got back was a lousy response saying that you have forwarded my email on for further investigation and you gave me a reference number. I’ve phoned your customer service department and followed up with my reference number and apparently my complaint is now sitting with your technologist who will be investigating the query. Meanwhile… people are buying baby carriers which have been designed by me and copied and sold by Woolworths, countrywide. What makes this confusion so much more severe is the potential health and safety risks the Woolworths ‘Stage 1’ carriers pose in that it appears to conflict with recognized health and safety standards for baby carriers. “Baby on your back is recommended for babies up to 6 months.” – This safety warning appearing on the packaging of the Woolworths carrier is misleading as it appears that it is recommended that you wear your baby on your back if he/she is under 6 months, instead of over 6 months. This is arguably an unsafe position as it is impossible to monitor a newborn baby when they are worn on your back in a buckled carrier and if left unmonitored, there is a risk that positional asphyxia can occur. Therefore, should, God forbid, an infant become hurt as a result of the unsafe directions of the Woolworths carrier, give the striking similarities between the two carriers, this poses a severe risk to the reputation of my business, which places the safety of babies above all else. *Please note this is very different to how South African women often wrap their babies to their backs with a towel or woven piece of fabric and I am in no way comparing a back carry position in a buckled carrier to this form of babywearing. This means that people will most likely try to wear a newborn baby and assume that they need to put the babies legs inside the carrier, creating another safety hazard as there is no infant insert sold with the carrier to keep the baby in place from the inside, making it a possibility that the baby could slip through the bottom of the waistband, see below photo where Ryan Reynolds made this mistake with his own baby in a different brand of baby carrier (he should have been using the infant insert in this case – I am merely using this picture to point out the possible safety hazard). The day after I wrote this article, I happened to be at Canal Walk, taking my son to the movies, and spotted a Mother wearing her baby in the Woolworths Stage 1 carrier – with this exact thing happening, see pic below. I wanted to approach this Mother and offer her some baby-wearing safety advice, but how do you approach a Mother and tell her that the way she is carrying her baby may be unsafe, without offending her? Especially when she bought the product from a trusted retailer like Woolworths. The Woolworths Stage 1 and Stage 2 baby carriers threaten to tarnish the very foundations on which my brand is built, and will no doubt result in substantial damage to the reputation and income of my business. For a company whose values include “helping local enterprises to grow, and contributing to a prosperous, secure future for our country”, Woolworths – I’d say you have some explaining to do. I understand that mistakes happen within a big company, and maybe you have some sort of explanation for how this all happened, if so I’d love to hear it. As a South African manufacturer, we’d be happy to consider working together with Woolworths and ‘contribute to a prosperous, secure future for our country’ by manufacturing a local baby carrier option on your behalf. 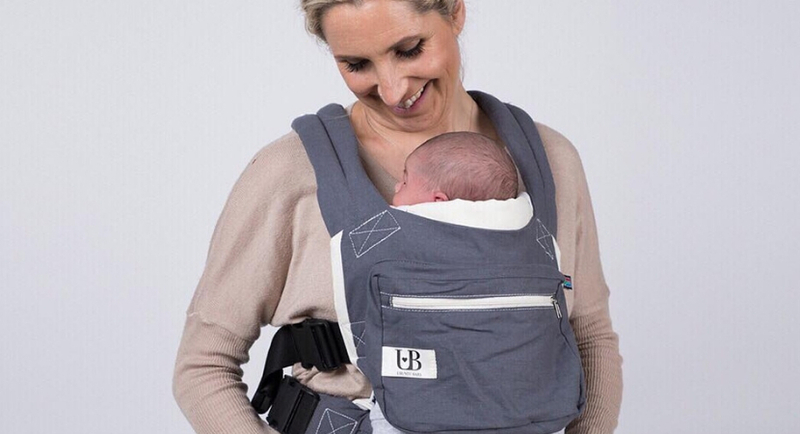 I’d personally LOVE to see an ergonomic and safe baby carrier on the Woolies shelves, because I know how much of a difference baby-wearing can make, especially during those first few very tough months of bringing a baby into the world. That is, of course, why Ubuntu Baba exists. So here’s my reference number, again: 20181224-380204207. Let me know when you’ve got some feedback for me.